The concept of pavement preservation is spreading across the United States, and as agencies get serious about it—and federal dollars go toward preservation—certification of agency forces and contractors also has taken a foothold. System pavement preservation also meets the asset management requirements for state agencies introduced by MAP-21 federal surface transportation legislation. As pavement preservation spreads, certification is spreading as well. There is nothing new about certification in highway construction. As early as 1974 the Federal Highway Administration (FHWA) and the American Association of State Highway & Transportation Officials (AASHTO) worked to develop a contractor certification program, and in 1976 AASHTO endorsed the program for voluntary use by state DOTs. These early certification programs were focused on pavement rehabilitation, reconstruction or new construction. 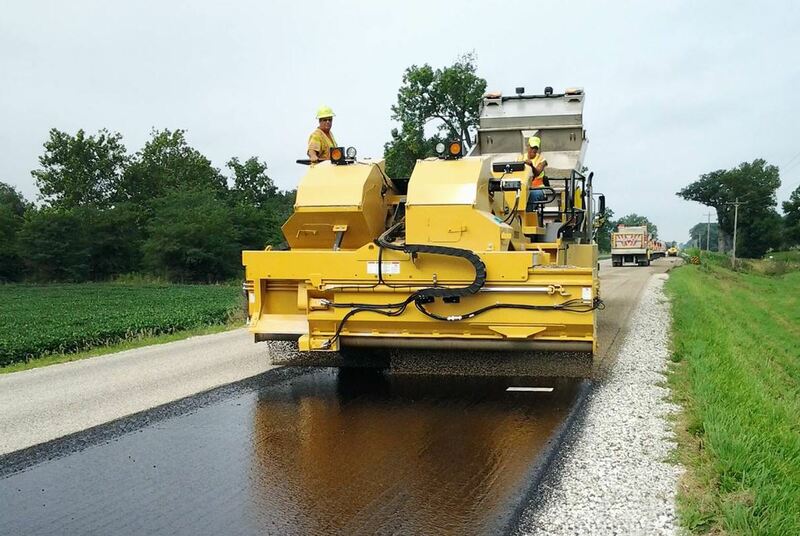 With the Indiana Department of Transportation performing more of its chip seals in-house, leadership wanted to ensure the core crewmembers, sub district managers and unit foremen were trained properly. At the time maintenance preservation treatments were frequently self-performed by state agencies. The change in legislation to allow use of federal funds for preservation—for which FP2 fought—has made certification more desirable for pavement preservation, as well as out-sourcing of the treatments in many agencies. A federal regulation requiring the use of qualified technicians on federal-aid highway projects went into effect June 29, 2000. Today, to receive federal funding for highway and bridge projects a quality control/quality assurance (QC/QA) program must be in place to make sure certified personnel are testing and inspecting materials used on those projects. Also fueling expansion of certification was the 2015 NCHRP Synthesis 483: Training and Certification of Highway Maintenance Workers, which explored the extent and need for certification on a national basis. The Transportation System Preservation Technical Services Program (TSP•2) was initiated as an efficient means to disseminate information to AASHTO member agencies for preserving their highway infrastructure, including both pavements and bridges. 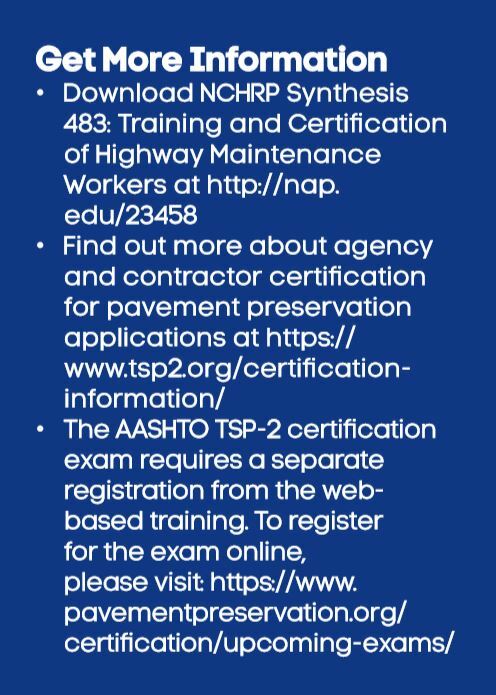 To bring certification to pavement preservation, the AASHTO TSP•2 oversight panel approved implementation of a pavement preservation certification program April 13, 2016, to be administered by NCPP as an independent assessment entity. The program has two different tracks: Agency Certification, and Contractor Certification. Today, following web-based training established by the International Slurry Surfacing Association (ISSA), treatments available for certification include slurry systems, which covers micro surfacing, slurry seals and polymer modified slurry; chip seals; and crack treatments. An overview of this training is available at http://www.slurry.org/page/education. “Historically many agencies performed their preservation function using in-house forces,” Corley-Lay said. “Over time the pendulum has swung toward more outsourcing of maintenance functions. When that happens you have contractors taking on work that historically they have not done, and you have a new area of inspection for state forces which historically have inspected new construction, not preservation. After a morning of review and information, students sit down for a 50-question test. Success requires a score of 70 percent or better. Certification of agency personnel under this program will ensure that future investments in preservation treatments will pay off, said Larry Galehouse, P.E., then-director of the NCPP, and Rex Eberly, global sales manager, Bergkamp Inc., in a presentation at the National Pavement Preservation Conference 2016 held in Nashville. Certification also establishes individuals in the agency as technical experts. Larry Galehouse and Eberly said ideally agency-certified individuals will include one senior-level inspector and design engineer from each district or region, an engineering/preservation specialist from the agency headquarters, and outside consultants who are providing outsourced inspection services. The agency participation in the certification program is voluntary, and individuals who pass the certification exam receive a certification card, which is valid for three years. The exam consists of 50 questions focusing on fundamental aspects of the treatment, such as project selection, materials and inspection points. The exam requires a minimum score of 70 percent to pass. Alternatively, NCPP has offered exams during ISSA’s annual Slurry Systems Workshop. Neal Galehouse said, “We are beginning to offer the exams in conjunction with the TSP•2 regional pavement preservation partnership meetings.” Individuals or small groups also may receive an exam through an independent university proctor center; most states have numerous locations available for proctoring the exam. 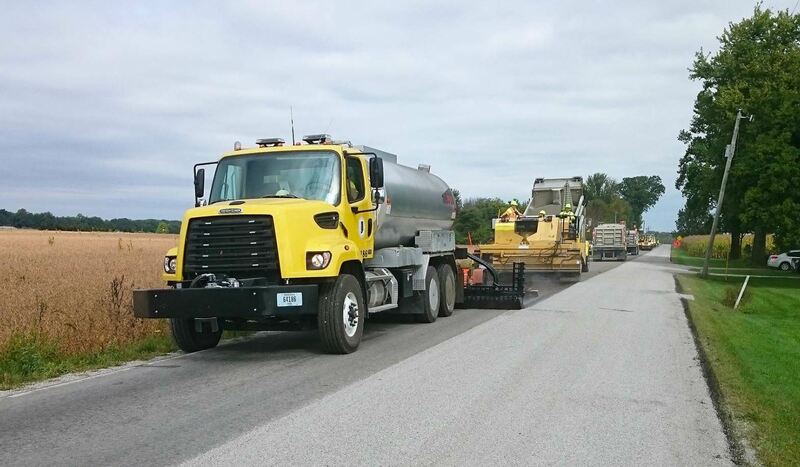 The Indiana DOT (IDOT) has certified its staff for certain pavement preservation treatments. Certification is not compulsory, nor is it written into the spec. Still, it made sense for IDOT. Thus the DOT had its full complement of workers go through the ISSA training, and a few weeks later NCPP did refresher training to a select 36 who took the exam. The refresher took place on a morning, and the exam in the afternoon. “There is a 50-question exam for agencies, which is geared toward supervisors and inspectors, and an exam for contractors, which is more ‘nuts-and-bolts’ equipment-oriented,” Shields said. “Because we do our own chip seals, we took the 80-question contractor exam.” Of the 36, 34 passed the exam and were certified. Those who didn’t pass got another chance later. Complementary to government agency forces certification is private sector contractor certification, but it takes place within a different framework. Alone among the states, only Nevada requires a contractor to be certified prior to placement of certain preservation treatments. In 2016, the Nevada DOT began requiring contractors to be AASHTO TSP2-certified in order to perform work on Nevada DOT chip seals and micro surfacing projects. This requirement is now also being specified for agency people and for consultant personnel facilitating the projects. Earlier this year, the Western Region Association for Pavement Preservation (WRAPP) partnered with the University of Nevada-Reno, the Nevada DOT, and the NCPP to bring pavement preservation training and certification to Reno. On March 28, certification training was attended by over 60 people from contractor and public agencies in California and Nevada. It was provided free of charge to agency attendees on a first-come, first-served basis, reported the June CP2 Center News, published by the California Pavement Preservation Center. Topics included pavement preservation concepts, evolving specifications, and construction techniques. This training was designed to prepare people for the certification exam the following day. The “joint” certification requirement—for both agency and contractor personnel—is a step toward producing consistent high-quality treatments, reported Roger Smith, pavement specialist with the California Pavement Preservation (CP2) Center at Chico State University. “The program currently provides certifications for fog seals, chip seals, slurry systems, and crack treatments,” Smith said. 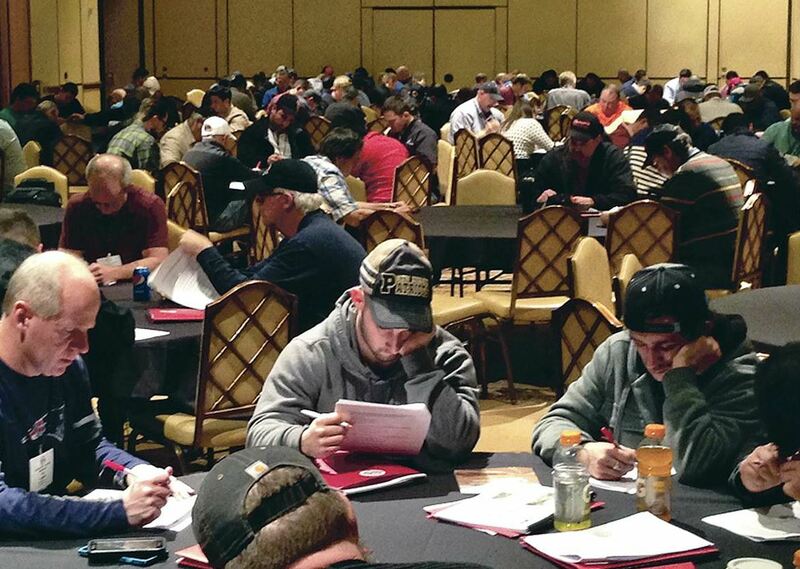 Following the March 28 training, 25 people took the AASHTO TSP•2 certification exam, nine of them from California. NCPP’s Galehouse administered the tests. “The certification process has been reviewed and approved by ISSA’s board of directors, and we’ve worked hard to make it a process that works well for the agency and contractor, has teeth so it means something, and will do what it takes to get better quality work out on the road,” Bergkamp’s Eberly said, in his joint presentation at NPPC 2016. The quality control plan must define the expected results and describe how those results will be achieved. It must detail the steps a contractor will go through to have a successful project, and how the contractor will determine that a problem will cause a project to not be successful, and the steps that will be taken to get the project back on track. That plan will provide a list of materials to be tested, what tests will be conducted, the location of the sampling, and testing frequency. A detailed testing schedule must be established. Article contributed by FP2 Inc. For more information, visit fp2.org.